Math Workshop for Kindergarten and First grade students. Hey friends, I hope that you are enjoying your weekend! This is a recap of the session that I did on Thursday at the SDE Kindergarten Conference here in Florida. In this session I explained how Deedee Wills and I structure the lessons in our math units so that the kids gain a deeper understanding of the math concepts that we are teaching. Our lessons follow a 5 step process as outlined below. 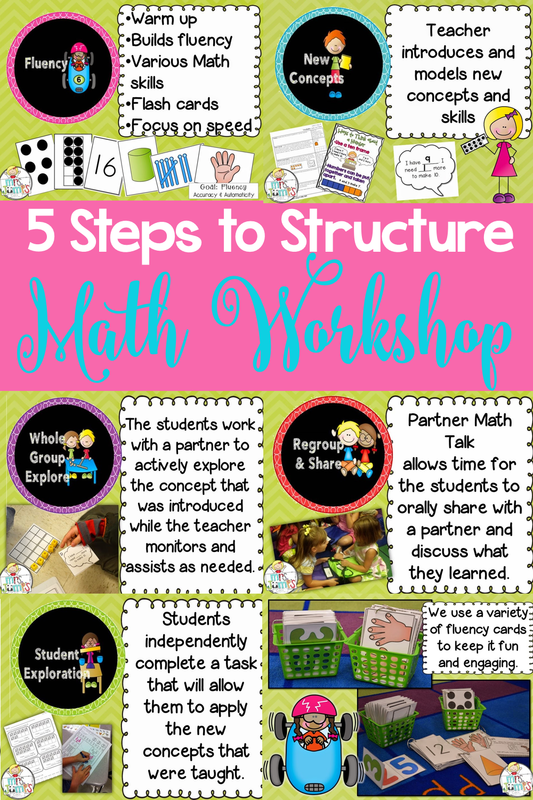 Click Here to download the handouts from this session as well as a one day lesson from our Guiding Kinders Math units and a free set of Tally Mark Fluency Cards. If you like how we have our Math lessons organized you can check them out by clicking on the images below. We have them available as individual units as well as a money saving bundle. Thanks so much for visiting my blog! Make sure you download the handouts from my session. It includes a few freebies! P.S. We also have the fluency cards available by themselves. I just bought the Guiding Kinders bundle this weekend, I'm so excited to get started. I already teach a workshop model, I just needed a little more structure (and student practice) and I think this will fit my needs perfectly! Thanks for the inspiration! Students finish independent practice at all different rates… What do you have kiddos who finish quickly do while others finish? Thank you, Deanna!! It looks great! And…your new blog design is adorable! HI Alisha, Check out Simply Skilled in Second. She has math units that are set up a lot like ours.